The forestry planting season is acknowledged by many as a tough job. It is physically demanding and requires stamina, good techniques and personal motivation. The season generally starts in late May, a time of year when daylight hours are short, and the weather is often cold and wet. Planting crews regularly work in steep, rugged hill country with long walks, carrying one hundred seedlings in specially developed planting frames. Individual planters get paid per tree planted, however speed must be moderated with planting quality which is essential for the trees to establish successfully. At the end of the job, the crew is paid for the quality and coverage of their work. 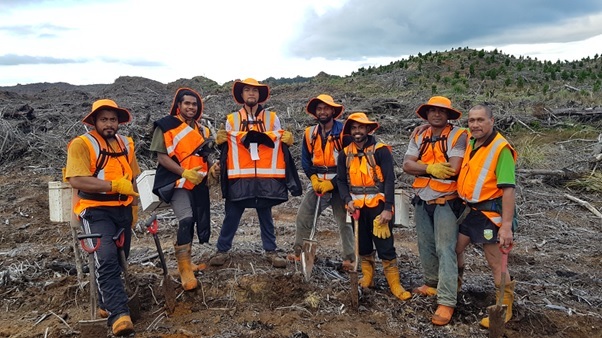 The planting season requires careful planning and significant resourcing in terms of tree stocks and labour and the highly seasonal nature of forestry planting work means that a large portion of the workers are transient. To support planting crews and help them prepare for the planting season, PF Olsen, with the support of their clients and forest owners, introduced pre-start workshops, mid-season BBQ lunches and competition days, grocery voucher incentives and rewards linked to performance and drug free crews. The outcomes of these initiatives so far have been positive with drug testing results showing a marked reduction in impairment at work and a much more consistent work attendance rate throughout the season. PF Olsen aim to improve these initiatives each year based upon what their crews find most beneficial for their employee’s morale and skills. The 2019 season is looking challenging with a large planting programme and a huge public focus on forestry but PF Olsen are confident that by working together with their planting crews and clients, it will be another successful season.